(CNN) -- Staff Sgt. Bartek Bachleda doesn't consider himself a hero, but passengers on a recent jumbo jet flight might beg to differ. Staff Sgt. Bartek Bachleda says he knew the plane he was riding in was losing fuel and videotaped the problem. 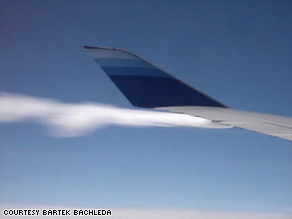 One of 300 passengers on a United Airlines flight from Chicago, Illinois, to Tokyo, Japan, in April, Bachleda noticed white "smoke" billowing from the left side of the Boeing 747-400 jet on takeoff and then again at cruising altitude of over 30,000 feet. He said he was sure it was a leak, a big one that could lead to a potentially dangerous situation. Bachleda, 30, should know. He serves in an air refueling squadron in the U.S. Air Force. He videotaped the midair vapor from his window seat and tried to warn a flight attendant. But at first, she paid him no heed. "When I initially hit the call button, she thought maybe I wanted something, and she said, 'Sir, I'm handing out drinks, I'll be right back with you,' " Bachleda said. Undeterred, Bachleda called her back to his seat. "Ma'am," he said. "It's looking bad." He identified himself and showed the flight attendant his video. "The Situation Room" with Wolf Blitzer is the command center for breaking news, politics and extraordinary reports from around the world. "I decided, if the captain doesn't know about this before we go oceanic -- meaning once we fly over the ocean -- and we're leaking this massive amount of fuel, this is going to be a bad day," said Bachleda, on a return trip back to Kadena Air Base in Japan, where he is stationed. United Airlines spokesman Jeff Kovick said the crew was already aware of the situation and was considering what action to take when Bachleda brought it to their attention. He said the captain would never have attempted a Pacific crossing. In Bachleda's estimation, the plane, which United said has a capacity of 373,000 pounds of jet fuel, was losing about 6,000 pounds an hour. Over the course of a 13-hour flight, the plane would have lost about 20 percent of its tank. But a former NTSB official said the plane still would have had to land because it lacked extra fuel to divert once it was over the Pacific or circle at its destination. The jet landed in San Francisco, California -- with all 300 passengers safe.